A Jewish-Catholic Partnership against Islamist Violence? The Pope's failure vociferously to denounce Islam-based violence concerns many among both Church hierarchy and lay people. The pope's statements regarding Islam and his refusal directly to discuss mounting Christian martyrdom in Muslim lands defy credulity. Whether his words are willful blindness, innocent naiveté, or intellectual ignorance of the nature of Islam itself, it is confusing many of the faithful. One moderate Muslim leader, Yahya Cholil Staquf, head of Indonesia's Nahdlatul Ulama, said that Westerners "should stop pretending that extremism and terrorism have nothing to do with Islam." The Chief Rabbinates of world Jewry apparently want to partner with the Vatican to combat radical Islam. In a recent letter, they proposed a formal alliance between Judaism and Catholicism, calling "upon the [Catholic] Church to join us in deepening our combat against our generation's new barbarism, namely the radical offshoots of Islam." This extraordinary alliance would unite Orthodox Jewry and the Holy See against their common enemy, jihadist Islam. The Rabbinates' letter identifies "the very real danger facing many Christians in the Middle East and elsewhere as they are persecuted and menaced by violence and death at the hands of those who invoke God's Name in vain through violence and terror." The authors of this missive to Pope Francis -- the Chief Rabbinate of Israel (CRI), the Conference of European Rabbis (CER), and the Rabbinical Council of America (RCA) -- represent the vast majority of the world's Orthodox Jews. Representatives of Judaism's Conservative and Reform wings did not sign the letter. Seemingly, any successful efforts by the Orthodox community to elicit the support of Conservative and Reform Jewish leaders would further strengthen the initiative's standing in the Vatican. "His (Jesus') passion cannot be charged against all the Jews, without distinction, then alive, nor against the Jews of today. Although the Church is the new people of God, the Jews should not be presented as rejected or accursed by God, as if this followed from the Holy Scriptures." The rabbis proposed an alliance to fight Islam-inspired anti-Semitic and anti-Christian narratives. The rabbis also praised Pope Francis for his 2015 Apostolic Exhortation "Evangelii Gaudium" ("Joy of the Gospel") as it acknowledges "that God continues to work among the people of the Old Covenant, bringing forth treasures of wisdom which flow from their encounter with His word." In addition, they complimented Francis for his denunciation "of a new, pervasive, even fashionable form of anti-Semitism." Nor those who went astray (Christians) "
Pope Francis has yet to address this reference and the many other denunciations of Jews and Christians in the Koran. The following examples illustrate Pope Francis's public approach thus far. Avoiding criticism of Islam, he called the Koran "a prophetic book of peace." Also, on a flight back from Poland, he told reporters "It's not right to identify Islam with violence. It's not right and it's not true." More bewildering however, is his comment following the horrific murders at the satirical magazine Charlie Hebdo in Paris: "in freedom of expression there are limits... you cannot provoke. You cannot insult the faith of others. You cannot make fun of the faith of others." The Pope's failure vociferously to denounce Islam-based violence concerns many among both Church hierarchy and lay people. Some may wonder what motivates Francis to avoid pointed criticism of the violent excesses committed by the Muslim faithful. Some may also ask why Francis avoids condemning the extremist rhetoric of imams routinely urging attacks against Christians and Jews. The reluctance of Francis to criticize Islamic violence while not hesitating publicly to condemn evil, corruption, and social injustice elsewhere, invites inquiry. One explanation for the Pope's seeming naïveté about Islam's hostility to Judeo-Christian civilization might be his perception of his role. He may well believe that his mission is to lead all men to Christ. No doubt he also believes that all things are possible in a God-created universe, even the ultimate conversion of Muslims to Christianity. On a human plane, he may understand that there is little hope for the peaceful coexistence of Judaism, Christianity, or secular democracy with Islam. The Church has a long view of the ways God moves in history. In this sense, Catholicism and Islam share a casual view of transient ideologies, governments and nation-states. Even so, the Pope's statements regarding Islam and his refusal directly to discuss mounting Christian martyrdom in Muslim lands defy credulity. Whether his words are willful blindness, innocent naiveté, or intellectual ignorance of the nature of Islam itself, it is confusing many of the faithful. One moderate Muslim leader, Yahya Cholil Staquf, head of Indonesia's Nahdlatul Ulama, said that Westerners "should stop pretending that extremism and terrorism have nothing to do with Islam." 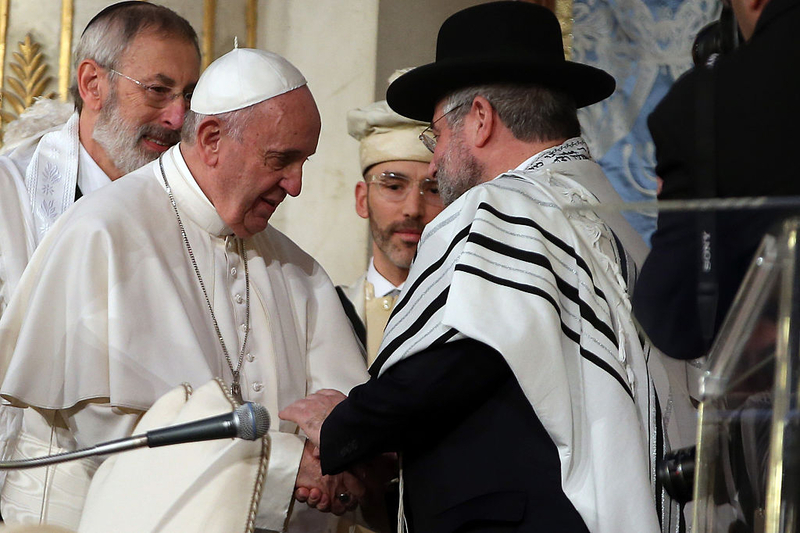 The Rabbinates' proposal for an alliance will receive a polite hearing, especially by the Vatican's "Commission of the Holy See's Religious Relations with Jews" and "The Pontifical Council for Inter-Religious Dialogue." As yet, however, there is no sign that Francis will alter his outreach to the Muslim world or become more critical of Islam-based extremism. Another possible reason for the Vatican's reluctance might be its concern for minority Christian populations residing in Muslim-majority countries. Still another might be the Vatican's responsibility to secure Christendom's sacred sites in the Holy Land and to protect Vatican property and financial interests. Pope Francis is no doubt sensitive to possible Muslim misperceptions about his intentions. The Vatican is not game to rejoin a centuries-old battle against Islamic expansionism. Indeed, Francis would want to avoid repeating the anti-Christian violence that followed Pope Benedict's obscure criticism of Islam. Responding to moderate and extremist indignation at Benedict's having quoted a medieval Christian Emperor's critique of Islam, Muslims killed a nun in Somalia, beheaded a priest in Iraq, and attacked churches in the West Bank. Francis is also aware of the potential of explosive anti-Christian violence that might follow any cooperative effort by Jews and Catholics to combat Islamist violence. Indeed, Islamic leaders such Yusuf al-Qaradawi, the Muslim Brotherhood's principal theologian with a global Muslim following, called for "Al-Youm Al Ghadah" ("Day of Rage") after Pope Benedict XVI's lecture critical of Islam, that he delivered in Regensburg in 2006. For Jews, religious or secular, particularly in Europe, a partnership with the Vatican would provide a psychological boost, as many have already fled rising anti-Semitic, Islamist violence. While the Rabbinates' proposal does not have the public endorsement of secular Jews, there is little doubt that many embrace similar sentiments. The document outlines the threat that both radical secularism and extremist Islam pose to religious liberty and the shared values of Judaism and Christianity. The Symposium on "Anti-Semitism and Minority Rights in the Middle East," sponsored by the Institute for the Study of Global Anti-Semitism and Policy (ISGAP), convened in the Vatican on September 13, 2017, may provide Pope Francis a venue to embrace, or at least mention, this appeal for partnership. Despite the Vatican's cautious approach to Islam-inspired violence, this unprecedented offer of partnership by Jewish religious leaders must tempt some within the Vatican's hierarchy to consider embracing their initiative. The Church is relieved after finally having purged remnants of anti-Semitism in its midst, in part due to the efforts of Pope John Paul II. It is now proud of its improved relations with official Judaism and the Jewish people. Catholics, especially those who are minorities in Muslim-majority societies, and some of whom suffer persecution by Islamic militants, would presumably like Francis vigorously to defend their rights. The Vatican may nevertheless continue to mollify Muslim sensitivities, while still hoping to limit ongoing martyrdoms of Christians. This cautious approach is likely to endure until a catastrophic anti-Christian Islam-based atrocity precipitates a rebellion within the Church's hierarchy. Catastrophic Failure: Blindfolding America in the Face of Jihad by Stephen Coughlin. Center for Security Policy Press: Washington D.C. 2015. Symposium at the Vatican, "Embargoed Announcement" sent to author by Richard Shonfeld, 7 Sep 2017. The pope is not naive, nor is he willfully ignorant. He is a religious syncretist. He is promoting the New World Order. He perceives Islam as a source of civility, a source of just global governance, a source of "economic democracy" and in keeping with Roman Catholic theology, a source of eternal salvation. The pope's enemies are conservative American Constitutionalists, conservative Protestant or Catholic Christians and any form of nationalism. I have no time for the pope or any members of the papacy. He is supposed to represent Jesus Christ but he lives in unspeakable luxury whereas in the Bible we read that "...the son of man had nowhere to lay His head". Jesus was not rich, He worked for His living as a carpenter and after His ministry began he depended on the goodness of those He served as He went around preaching the Gospel - I get the feeling His disciples' families were very helpful and his mother looked out for Him too. Let's look at history. The first Crusade, 1096, was called to "protect Christians". The problem is that Rome waited for over 4 centuries until it's rival, the Byzantine Empire, finally fell to Muslim conquest leaving Rome the primary leader of Christianity. Where was Rome's care and consideration while it's rival as the head if the Christian world was conquered bit by bit? I feel I must comment on the Pope's silence towards defending all Catholics living in the Middle East, since his visit there. The Pope is a Holy man who loves his people, and I'm sure he was THREATENED in some way, and since his return from his tour he has spoken NO word in defense of Christianity. I'm very unhappy to hear of all the destruction of Churches and of the persecution of the Christians and other Faiths. The Jewish rabbinate's hope for liaison with the Vatican is a hope that will not come true. This Pope is no John Paul, this Pope is a Communist without being "card carrying." I admire the courage of the Jewish Rabbinate, but they know they cannot be all things to everybody, and the present Pope dreams that he can be all things, to the detriment of the Roman Catholic faith. As others have pointed out, I'm afraid this is the wrong Pope to expect any action of which the average radical Leftist would disapprove. Another excellent article, I can understand why the church is careful not to cause offense. After all it has to protect its followers who reside in Muslim countries. But, I am sure there is a way that it can help Christians. Invite all of them to live in Christian countries.that way the church can finally be free to speak the truth. Unfortunately for the Catholic Church, the cardinals have elected a socialist and a fool to be pope. If they are stupid enough to do this again, they will no longer have a church, but some sort of leftist social club. Francis seems more intent on advancing the leftist political agenda than conforming to what has been traditional church doctrine -- more politician than priest. If this isn't reversed, the church will disappear -- people go to church for the message of faith, hope and comfort it has traditionally provided, not to be lectured on the evils of capitalism, or indoctrinated in politically correct positions and behavior (Islam a religion of peace, etc.). There remain disagreements and problems over (1) Israeli policies e.g. in the West Bank,(2) the attribution of Nazi antisemitism to the "New Testament" and (3) the earlier role of Jews in communism. These must be solved or mitigated with accurate scholarship, honest optimism and a good grace on all sides, even if prudently in private dialogue. This odd new Pope, whose orthodoxy and naive anti-xenophia is questioned, cannot risk being seen as a pliable puppet of a Jewish conspiracy which will feed current antisemitism to the advantage of no-one. Better that Jews should join others in public opposition to e.g. Chief Rabbi Pinchas Goldschmidt who wants Muslims and Jews to unite against the (present) majority of European Christians and Secularists alike. My Jewish friends. You're not sure if the Pope is on your side? Good luck. I'm RC and I'm not sure he's on OUR side either!! G-d Save Israel and Jews everywhere. I don't want to live in a world without Israel in it. Dear Wendy Garner, you bet this Pope isn't on your side either; you are right! As for a world without Israel, the whole Middle East and North Africa would become Moslem, totally free to "liberate" Spain and France, over and above having already islamized mama Merkel. Israel is the bridgehead of Western Europe, its last stronghold. The Americans understand it, be the Europeans don't! Nor does the Vatican. The Indonesian Imam, Yahya Cholil Staquf, was pointing specifically to the relationship of "orthodox Sunni Islam" with violence in his remarks and any Judaism / Catholicism alliance could profit from a partnership with moderates like Yahya Cholil Staquf, with some of the Sufi sects and with the Ahmadis, all of whom have been brutalised and murdered by fanatical Sunnis in the past. In the case of Indonesia, that violence appears to be a feature of a bloody future. For this to happen a regime change at the Vatican is necessary. Vatican is not a republic. A regime change would mean an ecumenical council. Those happened 15 to 17 centuries ago! The very idea of a regime change would spark off such a negative reaction among the cardinals that I think they would all refuse to consider it. 62 Cardinals have spoken out on this Pope. Pope Francis is a false prophet and needs to be removed. Yet Benedict XVI resigned precipitately after speaking out against Islam. Can anyone still doubt deep influences in the Vatican / electoral college ? Pope Francis had been elected for political reasons by the cardinals in order to enhance the Holy See's influence in Latin America. Unfortunately, his marxist education might have obscured his mind. The result of his irrational encouragement of terrorist organizations like the Fatah and his personal hatred against the Jews and against Israel will ultimately result in weakening the Roman Catholic Church. The Vatican will no longer be the spiritual center of a billion Roman Catholics. History will judge his role in the decommissioning of a majority of European catholic churches, of the vanishing number of catholic priests, of the non-religious believers. He is behaving as if the Nostra Ætate never was issued, as if Pope Johannes XXIII never launched Vatican II: he has brought the Holy See back to Vatican I. Forget it! Rabinate Shmabinate! Jews! Time to leave Europe forever. Europe was never good to Jews. It is about to become even more terrible to Jews. Leave! Calling the Koran "A prophetic book of peace", or saying that it is not right to identify Islam with violence, is not only wrong, it is stupid and ignorant. Shame on the Pope. He (the Pope) will get no thanks from the Muslims. Thank you Lawrence A. Franklin, and Gatestone. the essence of diplomacy is saying "nice doggie", while looking for an opportunity to kick it in the head. the problem isn't that pope francis has conciliatory language towards moslems, but that he refuses to do anything else. his lack of moral conviction in the face of the evils of isis, both encourages the terrorists, and demoralizes christians. 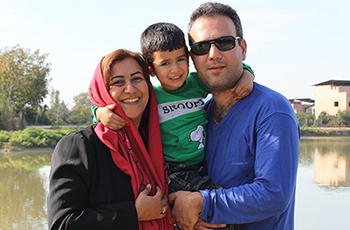 when he plucks 3 families from a refugee camp, it's a nice gesture that they're not all christian, but it sends the wrong signal when none of them are. as rabbi hillel said: "if i am not for myself, then who will be for me?"